Opticron was founded in the United Kingdom in 1970 and has recently opened distribution in the US. They offer low- and mid-priced spotting scopes, many of which have optimum specs for birding, hunting, target shooting and general nature observation. Opticron's goal is to provide optics that have excellent value for the price, and are covered by their Comprehensive no-fault warranty. Opticron MM4 GA ED Travelscopes replace the MM3 series. They are now waterproof and nitrogen purged and are available in angled or straight configurations with 50mm and 60mm objective lenses. They are among the few scopes at these sizes that have the ability to rotate ±90° in their tripod mount collars. 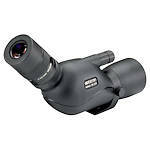 They are compatible with Opticron SDL and HDF eyepieces.